A database littered with redundant data does serious damage to quality of care and the bottom line. One of the most critical steps in maintaining any database is ensuring the stored information is accurate. In health care's universe, it can be argued that patient records hold the most important data, making it imperative there be only one record for each patient. 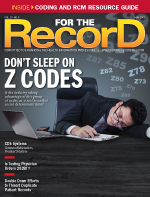 The industry has made steady progress in eliminating duplicative patient records, but rates still aren't ideal. William Marella, executive director of patient safety organization operations and analytics at ECRI Institute, a patient safety research group, says current estimates project 8% of any given hospital's records to be duplicates. That may not seem like cause for alarm, but Marella says, "it's still a significant number," adding that the majority of duplications occur at registration. In 2016, an ECRI Institute "deep dive" report reviewed more than 7,600 patient identification-related events and found that 12.6% of that total could be traced back to registration. There are several reasons why registration is a breeding ground for these errors, including the use of multiple disparate systems across the country, patients registered at multiple sites within the same health care system, and human error. Older admission, discharge, transfer (ADT) systems use what Marella describes as "sort of primitive matching techniques." Instead of utilizing probabilistic matching, a common technique in many technologies outside of health care, ADT systems often rely on deterministic matching, which requires an exact match. As a result, some ADT systems may not recognize that Rob Smith and Robert Smith are the same person. Hospitals that register patients at multiple points are also at risk of creating duplicate records. For example, a patient may enter the system through the emergency department, have tests performed in other departments, and visit a physician's office for follow-up care. At each of point of care, it's possible the patient may be registered into the system, making it critical that all staff members use the same set of identifiers. Trouble looms if the radiology department conducts patient searches using first name, last name, and address while the primary care physician's office opts to search by first name, last name, and phone number. In fact, Mark LaRow, CEO of Verato, says even identifiers that most of us think of as permanent are subject to change. "More than 50% of women in the United States still change their last name when they marry, and people are increasingly changing their gender. About 12% of the population changes their address each year," he says. Human error plays a large role in creating duplicate patient records. Misspelling names, misreading addresses, and selecting the wrong record are common miscues made by registration staff. In addition to producing multiple records, such errors can create "overlays," a situation in which two patients share the same record. Duplicate records also may be created during a merger. Whenever a consolidation or an acquisition occurs, the participating organizations must keep close tabs on how patient data are affected. "Part of the problem we are seeing is that [duplicates] are being created through new trading partner agreements," says Todd Winey, a senior advisor of strategic markets at InterSystems, pointing out that accountable care organization agreements are particularly sticky propositions. "When you are getting data from different sources that you have no internal control over, it has to be reconciled." Duplicate patient records cause an assortment of headaches, but the list is topped by its effect on quality of care. Imagine a patient with a condition that requires monitoring through regular testing. A new registration clerk at the testing facility cannot find the patient's record and assumes she is a new patient. The primary care physician requested the patient's record be flagged in order to be alerted should the test results meet specific conditions. However, since the registration clerk created a new record, the alert is never sent. Similarly, patients with duplicate records may miss out on medication or their hospital orders may not be implemented. Even worse, when two different patient records are mistakenly merged, the likelihood of mistakes increases. "If your physician can't accumulate all of the medical records for you because things were done in different places, they don't know your whole story," LaRow says, adding that the problem is exacerbated in the United States where care is frequently delivered across multiple institutions. "It's not just primary care doctors and specialists, but labs and radiology. Each institution captures an identity for you and opens up the possibility of errors." An under-the-radar quality of care issue caused by duplicative patient records is how they affect the measurement and tracking of various initiatives. Duplicative and overlay records will skew data, resulting in a misrepresentation of the quality of care being given at a particular hospital. Winey notes this will be of particular concern as population health initiatives heat up. Organizations with an abundance of duplicate patient records will have their bottom lines impacted. For example, a physician unable to locate test results may assume the request hasn't been filled and issue another order. "The constant repetition of tests is a major cost driver," LaRow says, noting that his brother recently faced that situation when he had multiple tests performed in two different states. In addition to driving up the overall cost of care, there is a strong likelihood that duplicate records slow down the entire claims and billing process. "A hospital that doesn't have a good handle on [duplicate records] probably has a lot of problems getting paid," Marella says. Claims processing suffers because payers must conduct manual processing when two claims for the same person with different identity information are filed, LaRow says. In a security-conscious environment such as health care, duplicate patient records only increase the chances of nefarious activity. Alexandra Priddy, director of partnerships and strategic alliances at NextGate Solutions, says that while encryption and other forms of data protection are usually on the top of minds of health care executives, sound patient matching practices can also help ensure data are where they belong. For example, duplicate record prevention can allay fears that patients paying their bills through a mobile portal are indeed viewing the correct information. "[Preventing duplicate records] will not prevent a data breach, but from a HIPAA standpoint, you need to make sure the patient is looking at their own record," Priddy says. The final straw in terms of how duplicate patient records can devastate a health care organization may be their effect on patient trust, a key factor to consider in an increasingly competitive business environment. Winey points out how frustrating it is for patients to endure multiple registration processes or have to deal with the nightmare of being billed for services they never received. Although an industry average of 8% duplication is significant, it is a vast improvement over previous figures. Ten years ago, duplicate patient record rates were as high as 30% in some institutions, according to LaRow, who notes technology has helped lower that rate. "As of now, almost every large health care institution has a large MPI [master patient index] of one sort or another," he says, as opposed to each department having its own patient database. According to LaRow, there have been two huge drivers behind the improved duplicate record rates: a movement toward integrated hospital systems and a move away from purely integrated systems in favor of best-of-breed solutions featuring enterprise MPIs (EMPIs). This represents a major sea change, he says, adding that it is "a gigantic achievement at great effort and cost." Today, one out of 10 patients in any given hospital system is likely to have an "alter ego," says LaRow, who cautions that that figure multiplies across systems. While the move toward integrated systems has helped lower the duplication rate, it also has placed greater importance on accurate data. Marella points out that organizations participating in regional health information exchanges (HIEs) "are in the position of having to consume information from other health systems and trusting that that information is accurate, and they don't really have any independent ability to validate it. The more integrated we make the health IT infrastructure, the more important it becomes to make sure the information is accurate and up to date." While much improvement has been made in eliminating duplicate patient records, there's much work to do in order to meet the Office of the National Coordinator for Health Information Technology's goal of organizations having a duplication rate of less than 2% by 2018 and 0.5% by the end of 2020. There are several ways those goals can become reality. For example, organizations can adopt biometric devices, such as thumbprint readers, to reduce registration errors. If a patient changes address, name, or gender, his or her thumbprint remains the same. By using biometric capture—whether it is through a thumbprint scanner, facial recognition software, or an eye scanner—errors at registration can be decreased. Periodic "cleanups" also can produce a drop in duplication rates, LaRow says. Hospitals typically contract a third party to examine patient records and identify duplicates. However, this automated process is not always effective and could conceivably worsen the problem, depending on the circumstances, he notes. To help matters, hospitals can devote staff to conduct regular examinations of the MPI. It can be a slow process to manually correct errors, says Winey, who recommends implementing processes to avoid manual reviews whenever possible. "It comes down to process improvement; try to fix the problem only once," he says, adding that quality management is necessary. Richard Garcia, vice president of marketing at NextGate Solutions, says an MPI, which is designed to work within a single vendor's system, is not sophisticated enough on its own to curtail duplicate patient records, noting that advanced technology, such as EMPIs, is better equipped to do the job. "[EMPIs] can accommodate and evaluate identifiers from any vendor system and provide the more sophisticated level of matching that a multivendor environment requires," he says. Priddy says vendors must dedicate more time and money to product research and development, and "put a lot more effort into educating people about data stewardship." Winey also recommends organizations concentrate on data stewardship, suggesting hospitals understand the integrity of incoming data. Creating a "golden record" requires a process to integrate only data confirmed to be accurate, he says. "Part of it is that you need to have an identity data management strategy not just at registration, which you can actually get pretty clean, but also when patient information comes in from somewhere else, it goes through a business and technology process to validate the quality," Winey says. Take the case of a merger in which one system sports a duplicate patient record rate of 5%, while the other carries a 12% rate. Winey says it would be wise not to merge the databases. "It's pretty easy to pollute a data source if you have bad input," he says. "[A merger] is where data quality tools come into play to support your process and identify the quality of data coming in. That way you can fix the problems at the source, and if the source can't be cleaned up, you know how to handle it as part of your data strategy. That may mean not using all or part of the record you know to be of poor quality." "There's the concept of real-time matching, where any time a patient comes in, the staff does a check across the organization. This keeps the data clean," Garcia says. "It's not an expensive or laborious process. It's not like an EHR implementation." However, Garcia cautions that creating a system in which each patient is assigned an identifier is not likely to correct some of the current problems. "You are creating a single point of failure," Priddy notes. As industry standards continue to evolve, hospital networks will most likely expand their duplicate patient record efforts beyond their walls and adopt a "big picture" point of view. An EMPI that reaches across an entire network is a step in the right direction. Priddy says much of the onus falls on vendors. "We need better working relationships between vendors to leverage tools," she says. "That has to come from the customers. They will have to push for it." The entire process, from registration and data stewardship to implementing and maintaining an EMPI, must continue to make progress. With better processes at registration, there will be fewer duplicates created. With careful policies regarding data aggregation in place, duplicates can be identified and eliminated during system mergers. As technology evolves, resulting in more probabilistic searches and a greater ability to recognize and flag potential duplicates, effective patient matching will lead to improved patient care and significant cost savings.